Hilton has a triple miles offer for Jet Airways and Kingfisher. I am not sure why they have even bothered to include Kingfisher as the airline has suspended all the operations indefinitely. 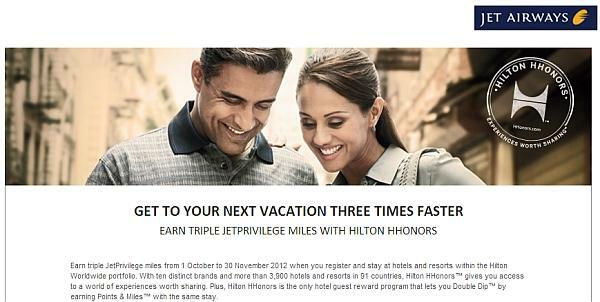 You can earn triple Jet Airways JetPrivilege miles at Hilton properties worldwide between October 1 and November 30, 2012. You need to register for this promotion and have Jet Airways chosen as your preferred Double Dip partner. 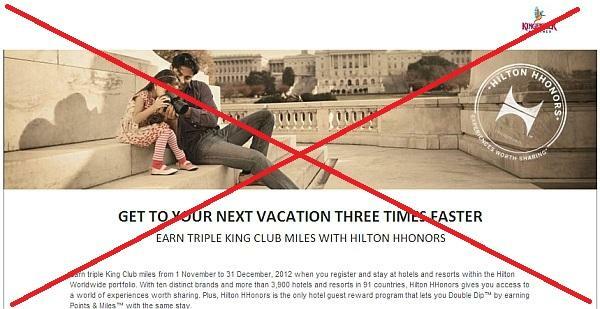 You can read more about Hilton’s Double Dip options here. You need to choose between Points & Variable Miles and Points & Fixed Miles. Which one of these two options you should choose is dependent of the hotel brand and the eligible folio amount. If your hotel folio amount is less than $500, you should choose the fixed miles (500) instead of the variable miles (1 mile per eligible dollar. If your stay is at Hampton Inn or Homewood Suites locations, the variable miles offer is better, when your folios is more than $100. The fixed number of miles earned at these two brands is capped at 100. At Home2 Suites locations you should always choose fixed miles as both the fixed and the variable options are capped at 100 miles. You should not even consider crediting to Kingfisher King Club as the airline has been now grounded for more than a month. I think that it is highly unlikely that Kingfisher will ever take it off again. You can access this offer on Hilton’s website. Don’t even consider the Kingfisher offer. Triple JetPrivilege miles for Hilton stays is a decent offer. Offer valid for eligible stays completed between October 1 and November 30, 2012 (“Promotion Period”) at any participating hotel in the Hilton Worldwide portfolio. Hilton HHonors™ members must first register at HHonors.com/JetAirwaysTripleMiles prior to check-out of your stay within the Promotion Period. Registered HHonors members will only receive bonus miles for nights completed during the Promotion Period, regardless of a check-in date before the Promotion Period begins or a check-out date after the Promotion Period ends. To be eligible for this offer, you must (1) be both a member of Hilton HHonors™ and Jet Privilege; (2) select Jet Airways as your Double Dip earnings partner in your HHonors Profile, and (4) you must be a HHonors member to earn Points & Miles for hotel stays. Ensure that you select Points and Variable Miles or Points and Fixed Miles as your Double Dip™ Earning Style within your HHonors profile. A preferred airline must be selected in your HHonors profile. Please allow six to eight weeks from completion of your stay for miles to appear in your Jet Privilege account. Offer is not transferable, is not valid for groups and cannot be combined with other select offers. Hilton HHonors™ membership, earning of Points & Miles™ and redemption of Points are subject to HHonors Terms and Conditions.